What do Julius Caesar, Charlemagne, and our Founding Fathers, Thomas Jefferson, George Washington, and Benjamin Franklin, all have in common? According to Erin James, author and editor of SIP Northwest Magazine and Cidercraft Magazine, cider (the spirited version, not the non-alcoholic apple juice) was their beverage of choice. I was recently introduced to “hard” cider at the International Food, Wine, and Travel Writers (IFWTWA) convention on Whidbey Island, Washington. 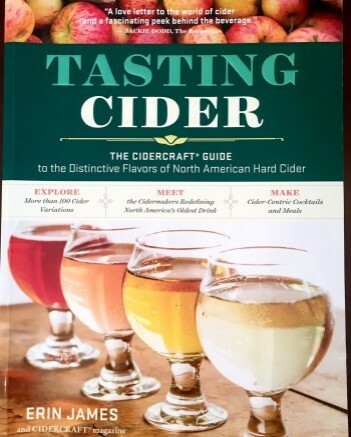 James, our keynote speaker, was very informative and all the lucky attendees received a complimentary copy of her book, Tasting Cider: The Cidercraft Guide to the Distinctive Flavors of North American Hard Cider. I would highly recommend this cider “primer” if you want to stay current on the latest trend in libations. Although cider has been popular throughout the world for centuries, it is also as American as apple pie. As early as the mid 1600s, Canadian settlers brought apple seeds and saplings to the new world and the first commercial cidery was born in North America, near what is now Montreal. Around this same time, the Massachusetts Bay Colony settlers planted apple varieties near present-day Boston, and soon farmers and home brewers were fermenting apples and making cider. An added benefit was that the fermentation made cider a safer alternative to drinking water, which in those days was often contaminated. James explains that "yes," there really was a Johnny Appleseed. Botanist John Chapman spread apple seeds around Pennsylvania, Illinois, West Virginia, and Ontario. However, he was planting cider apples, which are specifically grown for making the fermented beverage, and completely different than culinary or dessert apples. Prohibition legislation hindered cider production in both the United States and Canada, but a resurgence of consumer interest has been sparked by an enthusiasm for all things trending today—craft beer, artisanal food, gluten-free beverages—along with the farm-to-table movement. The Taste of Cider profiles some current cider producers, including Crystie Kisler of Finnriver Farm & Cidery who was a panelist at the IFWTWA conference. She and her husband, Keith, bought a fruit tree farm in Chimacum Valley, Washington, and after a neighbor introduced them to cider in 2006, they decided to dedicate their farm to cider production. They bought additional orchard acreage and now have over 6,000 apple trees representing almost two-dozen apple varieties. I am fortunate to have Finnriver cider available at my local Southern California BevMo, but if you live in other parts of the country you will most likely find some local cider producers. I encourage you to support them. Name brands such as Stella Artois Cidre, and Angry Orchard Cider are available in most areas of the country. James has a marvelous section on cider cocktail recipes in the book. And, since this is a cocktail column, I thought about what kind of cocktails I could make using this fast growing popular beverage. Although some “still” non-carbonated cider is produced, most cider is bubbly. 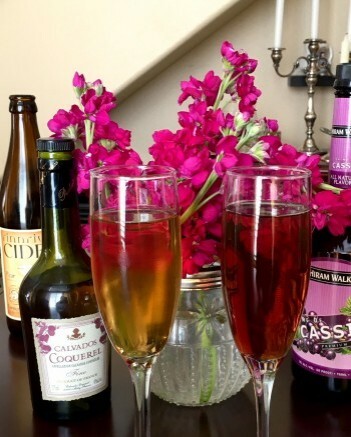 One of my long-time favorite cocktails is Champagne or sparkling wine splashed with a liqueur. I am especially fond of the French cocktail Kir Royale, made with sparkling white wine and Crème de Cassis, a black currant liqueur. 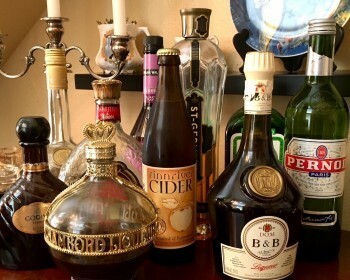 I had fun experimenting with cider and various liqueurs: Amaretto, B & B, Calvados, Limoncello, Goldschläger, Godiva, Chambord, St. Germain, Pernod, and Crème de Cassis. I was surprised how delightfully herbal and botanical the cider tasted with the addition of B & B or Pernod. Calvados, an apple brandy, enhanced and brightened the cider’s apple fruitiness, but also balanced its sweetness. You may want to experiment with your favorite liqueur. The recipe is simple. The cider must be cold, use only a splash or up to ½ oz. of liqueur (so as not to overwhelm the cider’s flavor profile), and serve the drink in a tapered glass to showcase the cider’s bubbles. Pour ½ oz. or less of your favorite liqueur into a Champagne flute or tapered glass.